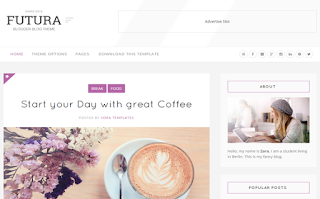 Futura is a trendy, modern and easy-to-use blogger templates with flexible and responsive layout. Futura is perfect for all blogging, lifestyle, design, art, styling, fashion, decoration, interior or personal websites. Loaded with the latest and most useful functionality, the Futura responsive blogger template combines practical elegance with powerful features.